I've haven't done a blog wishlist for such a long time! Also at the end of this post I will announce the giveaway winner. Tata Harper is pretty popular brand at the moment, I had a chance to try out the Nourishing Oil Cleanser when it had launched and I've fallen in love, really want a whole bottle for myself. The Purfying Cleanser also is on my wishlist, apparently it's also very good at removing all of makeup, great to use after a long day. 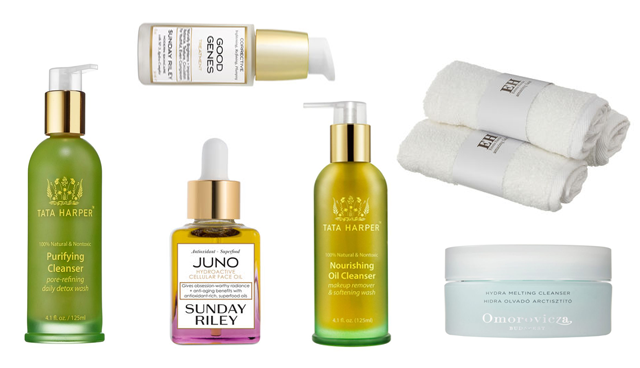 Luna is my all time favourite oil to use at night, I would love to try out more thing from Sunday Riley, Juno is one of the products which I would love to try out! So pricey, but if Luna is so good this must be fab too. I've seen so many postive reviews on the Good Genes Serum, would love it too. As I recently started using Balms to remove make-up Emma Hardie Cleansing Cloths would be very handy, personally I like them a lot more than the Liz Earle Clothes. Whilst checking out blogs I've came across the Omorovicza Hydra Melting Cleanser and I've had a chance to try out sample, it's so amazing!! Need to get my hands on the full size. Is there anything on the list you had a chance to try out? If yes, let me know what you think. The giveaway winner is: Kimberley Ryan, will send you a email today, congratulation!